My first up-cycle today is the faux washboard made solely for decorative purposes. As you can see I paid $1 for it. It has a copper color metal washboard. I painted the washboard with two coats of Dutch Boy Chalky Finish Paint in Antiquated Lace. I had some bleed through of the stain through the chalk paint so I brushed on a coat of Varathane Crystal Clear Matte water based poly and painted over the bleed. This seemed to work pretty good. Sources on the internet say to use shellac to prevent bleed but I didn't have any on hand. Sometimes the bleed gives the piece some age if it comes through brown or brownish yellow. I don't like the pink bleed. I used a stencil from the Plaid Decorative Icons stencil pack from Walmart. I distressed the washboard with the Plaid Layering Block. Click the link for more information on the technique. I found the layering block on Amazon. 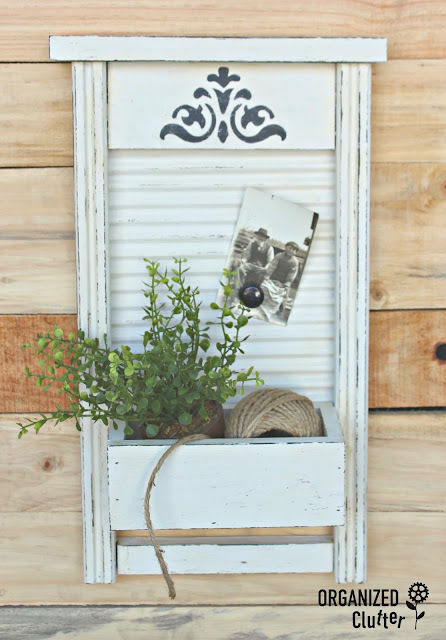 I think this tired old washboard has a great new look! 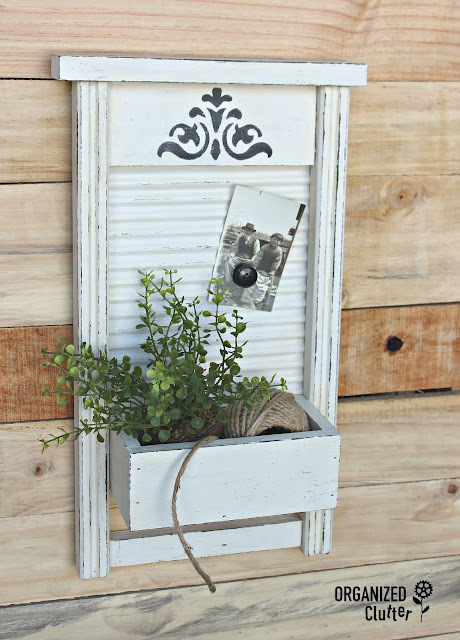 Since the washboard has iron in the metal backing, photos can be displayed above the box, and there are lots of decorative possibilities for filling the box. I picked up this maple two tiered vintage occasional table at a rummage sale in January. 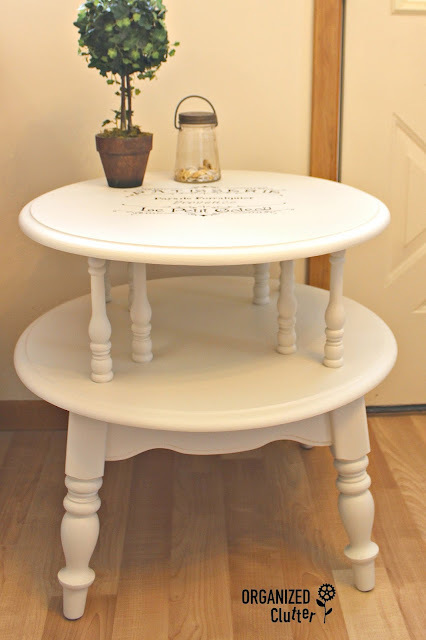 I painted the table with two coats of Fusion Mineral Paint. There was no prep, except cleaning, and no sealing. It worked great. I didn't distress the table at all. I used Fusion Mineral Paint in Coal Black for the tabletop stencil. The stencil itself is by Decoart. I wish I had a place to put this table, but I think I will have to sell it. It's pretty big. This last item was a practice board, that was warped. 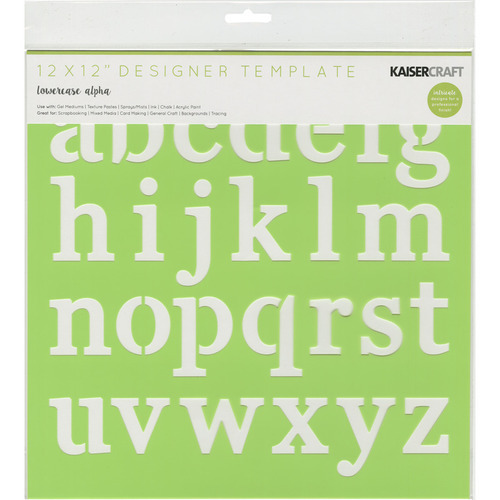 I went ahead and experimented on it anyway with my Kaisercraft lowercase letter stencils. I love this stencil. I may have to hang up my practice sign board because I kinda like it. I think maybe you should get some stencils and start making signs, and other decor for your home from thrift shop finds AND warped lumber too! It's fun! Great repurposing Carly. Pinned that sign! Sorry, meant to type Carlene. 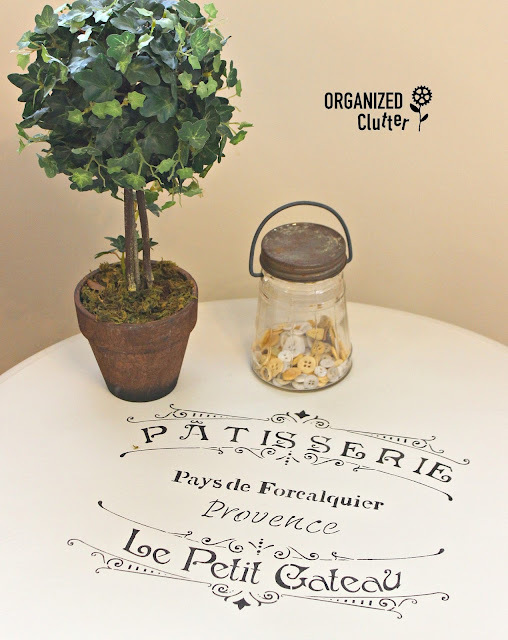 All these projects are really cute and creative! I think you're right. I do need some stencils. I always love yours! I was curious as to what you were going to do with that ugly washboard planter. Gorgeous!! 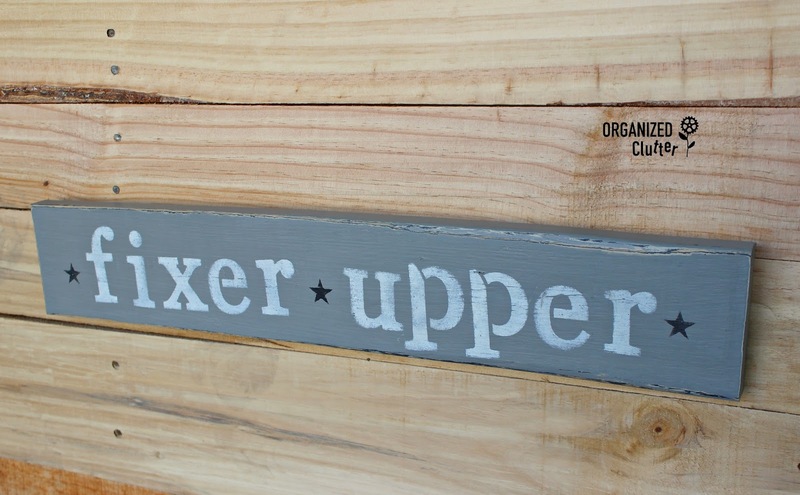 I really like the washboard and am going to keep my eye out for one! they all look great! i've never seen a table like that and it sure looks better painted! 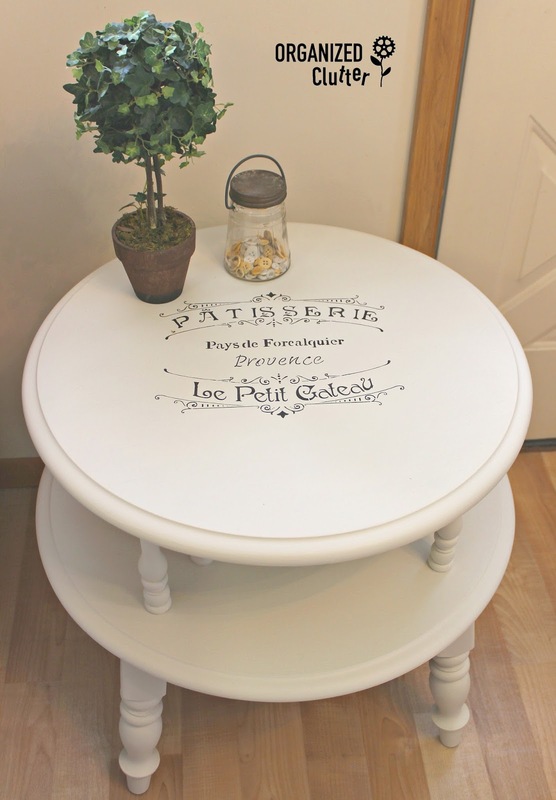 love the stenciling! 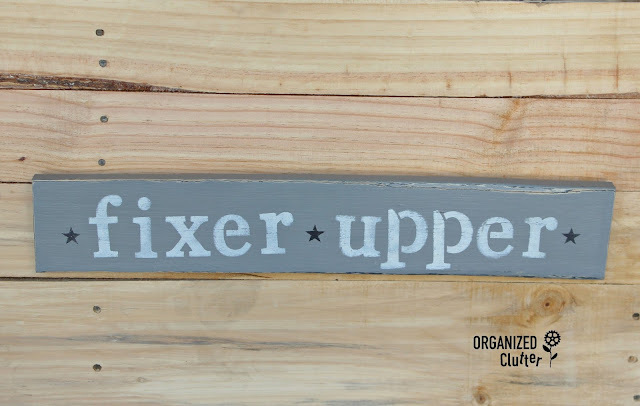 Love the washboard & how you painted & distressed it! And you're right, I don't like the pink bleed either. I struggling right now with that very thing with a project I'm doing. Can't get it stopped, so might have to cover it with decoupage. Love your table too! Love the washboard - where did you get one for 1 $??? It was a dated decor piece.